My mother was in a panic this morning. She called me over to help her with her garden because many of her tomato plants had suddenly developed yellow leaves, many of which (but not all) also have brown spots. Worrying that it was a disease, she pruned every yellow or even yellowish leaf that she could find on all of the tomato plants as well as the eggplant, strawberry, and shamrocks. I pointed out that it rained a lot recently and that it seems to have happened to different kinds of unrelated plants, and so could be hyponatremia (like with blossom-end-rot). Using this information, I managed to find a few web pages that seem to indicate that it could indeed be too much rain, but the same symptoms (well, at least the yellow leaves/brown spots) were indicated for several other things (this similar sounding question didn’t even mention over-watering as possible cause). Does anyone know what this is? Can anyone confirm if it is over-watering and whether they can recover if she can find a way to prevent them from getting soaked the next time it rains? Looking closely at the last picture, there are clear dark concentric circles around the black spots which is textbook early blight. It is a trademark of the disease. Blight has been bad, really bad this year. Your best chance is unfortunately to pull the plants and save any remaining healthy plants. Then going forward there are some key cultural practices to help avoid this situation (though you can never truly escape these problems which tomatoes are very susceptible to these diseases). Plant tomatoes far enough apart to promote good airflow between plants. If two plants are touching, they are too close. If you have to plant them close together, restrict them to a single vine by pinching out the suckers that grow from the elbows of the plants. MULCH underneath the plants. The diseases are most often in the soil and get onto the plant due to splash back during rain or overhead watering. Mulch eliminates soil splash. Water in the morning and water only the base of the plant. A good trick is to bury a 4" plastic pot next to the base of each plant. When you water, only water into that pot which will then drain out directly into the soil. Or another neat trick is to slice a few cuts into the bottom of a gallon milk jug. Fill the jug with water and set it on the soil near the plant. Over an hour or two the water will slowly leak out of the slits and gently water into the soil. Rotate organic fungicides such as Actinovate and Greencure. Spray BEFORE there are problems and continue to keep on spraying on a regular schedule. As soon as the plant goes in the ground, start spraying. If it rains, get out and spray. Both of these products are cost effective and work best as a preventative instead of reactionary solution. Rotate crops. DO NOT plant tomatoes in the same soil year after year. If you cannot rotate locations, dig up as much of the soil as possible and discard under ornamental shrubs. Replace with a good mix of compost and new top soil. Consider container gardening for tomatoes where you can then easily replace the soil every year in the pots and really start out with a near-sterile growing environment. Containers also allow you to quickly move diseased plants out of the area of the rest of your tomatoes. Get your soil tested and make sure the PH level is correct for tomatoes; generally between 6.4 and 7.0. Make sure there are significant enough levels of nutrients. Consider a fertilization program that meets the needs identified in the test. Stronger plants will stay healthier longer. At a minimum start using rock dust (such as Azomite) that will add micro-nutrients to your soil. Plant resistant varieties such as Roma VF. That is Early Blight, Alternaria solani. The earlier you treat, the better the control, as a strong infection will build up resistance to the fungicide. Do not touch the unaffected leaves with the removed portions, or your hands until they are thoroughly washed. Spray with a copper fungicide (like BONIDE© Liquid Copper Fungicide). Apply once every 5 days, and after any rain. Continue for 3-4 weeks, or until the plant stops developing the symptoms. When you water, try not to wet the foliage, or splash soil onto the leaf undersides. The fungus spreads faster in wet conditions. To go along with that, an organic mulch will help keep soil from splashing, and is also useful for many other reasons. Make sure the plants have a support to climb on. Rotate the plantings each year, to stop pathogens from inhabiting the soil. 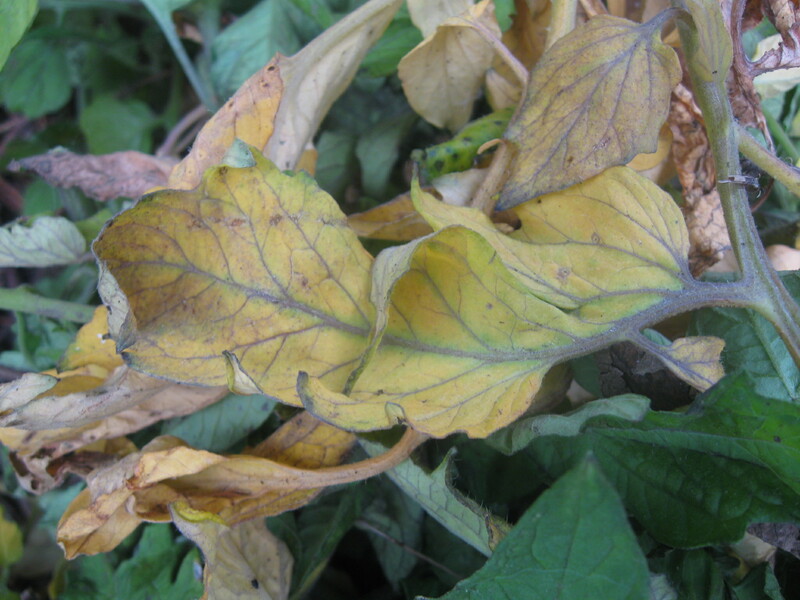 Remember that potatoes are also vulnerable to early blight, so plan accordingly. 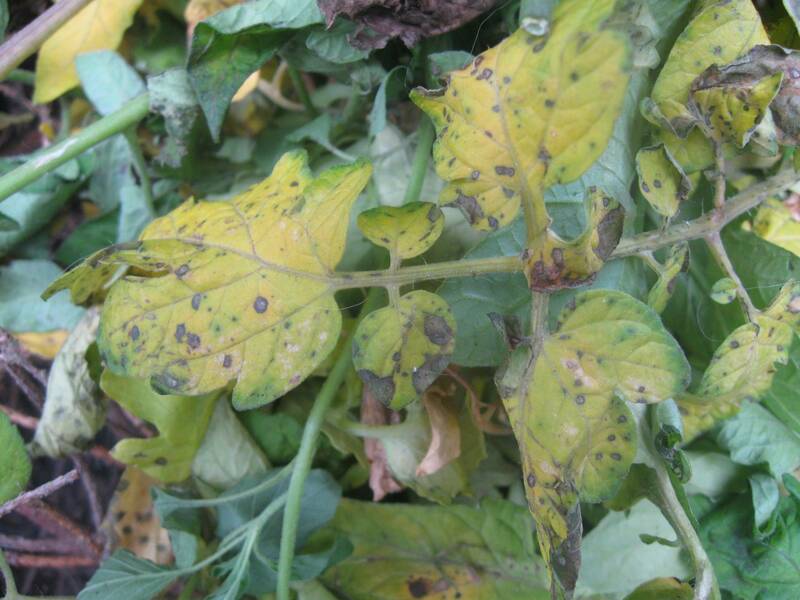 About the other nearby plants showing the same signs, Alternaria contains many species, which attack multiple plants. The hot, muggy weather and lots of rain are what helped the disease spread like that. 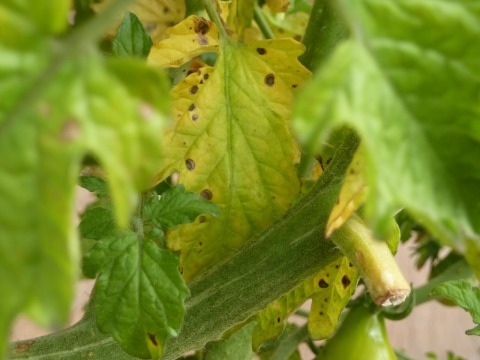 Gardening and Landscaping Stackexchange: What's affecting this tomato plant? You've just described my weather and tomato plants. The best I can figure, all the rain and humidity has provided the perfect conditions for fungus to thrive. I'm thinking Septoria lycopersici. Septoria leaf spot of tomato, caused by the fungus Septoria lycopersici, is one of the most common and destructive diseases of tomato in Virginia. The fungus can cause severe leaf spotting and defoliation is common following severe infection. Heavy leaf loss during wet seasons leads to sun scalding of fruit and failure of fruit to mature properly. Numerous, small, water-soaked spots, which are the first noticeable characteristic of Septoria leaf spot, appear on the lower leaves after fruit set. Spots enlarge to a uniform size of approximately 1/16 to 1/4 inch in diameter. They have dark brown borders and tan or light colored centers. Yellow halos often surround the spots. Severely infected leaves die and drop off. 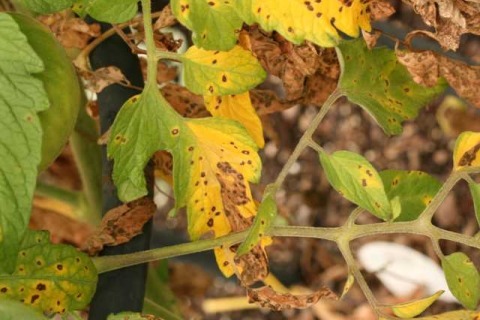 Septoria leaf spot is easily distinguished from early blight, another foliar disease of tomato, by the uniform, small size of the spots and the lack of concentric rings in the spots; however, Septoria leaf spot is sometimes confused with bacterial spot of tomato. The presence of fruiting bodies of the fungus, visible as tiny black specks in the centers of the spots, confirms Septoria leaf spot. Favorable weather permits infection to move up the stem, causing a progressive loss of foliage from the bottom of the plant upward. Plants appear to wither from the bottom up. Loss of foliage causes a decrease in the size of the fruits and exposes fruit to sunscald. Spotting of the stem and blossoms may also occur. Apply fungicides on a preventative schedule before the disease first appears on the lower leaves. Begin sprays when the first fruits of the first cluster are visible after blossom drop. Apply fungicides every 7 to 10 days or more often when the weather is warm and wet. In home gardens the fungicides, chlorothalonil (e.g. Daconil 2787) or maneb (e.g. Maneb), can be used. After weighing my options of copper sulfate mix, ferrous sulfate, or a chemical fungicide, I quickly ruled out copper because I don't want to cause a copper imbalance in my soil... that and copper is toxic to everything (plants, fungi, bacteria). I didn't want to be burdened by wondering if I'm applying too much. I went to lowes and reviewed the selection of fungicides. Many were neem oil based and seem to treat more trivial infections, which excludes septoria. Only one treated seemingly everything fungal, Daconil. So I bought it. After reading the label and considering the degree to which I had to protect myself from the chemical, and after using it once and feeling a little trepidatious to work around the tomato plants, I decided to shelve the Daconil pending further research into its safety. I settled on ferrous sulfate (Its called Copperas, its about $5 for 5lbs). Its safe for me and the plants, yet it makes things uncomfortable for fungi. Additionally, the iron and sulfate will help green the leaves. Due to heavy rain, sulfate will be one of the first nutrients depleted in soil because of its negative charge. To enhance fungicidal activity and correct possible iron chlorosis of the grass, Cutting recommends adding ferrous sulfate to the tank mixture at a rate of 1/2 oz./1,000 square feet of turf area. Ferrous sulfate is an inorganic chemical of iron and sulfate, and iron is an important component of photosynthesis. "We've been using ferrous sulfate with our fungicides since the early 1950s to increase the green of grass and improve the finish of turf," he explains. Data show that when turf is under stress, particularly during hot summer months, the grass plants have difficulty absorbing iron from the soil. When applied as a spray, iron can be foliarly absorbed through the leaf tissue. The result was Ferbam (sodium dimethyl dithiocarbamate + ferrous sulfate) is an excellent fungicide. I'm not going to claim the ferrous sulfate by itself is an excellent fungicide, but it does have some fungicidal properties. I mix about a teaspoon in a squirt bottle with water. While out pruning off branches having yellow stems or clusters of yellow leaves, I keep the bottle with me and give the plant a good squirting. Its important to remove the dead and dying branches, thereby eliminating some of the innoculum, and increasing airflow around the plant. I've even considered setting up a box fan in my garden. I also prune branches growing in the middle of the plant or those which never receive sunlight. The idea is to open up the interior to airflow. The distinction between overwatering and too much rain is that overwatering is drowning the roots producing a condition of suffocation to oxygen and starvation of nutrients a plant needs, while too much rain washes soil nutrients out of the root zone, starting with the anions (NO3, SO4) and then affecting the cations (Ca, K, Mg, etc). If you have well-draining soil, you can water a lot and not produce root-suffocation, yet you'll wash away nutrients. If you have heavy clay soil, you can water a little and still manage to suffocate the roots. Root suffocation would be similar to yanking the plant out and tossing it on the ground... the whole plant will suffer. Rather, in this case we have healthy plants with the exception of yellow leaves on the bottom. This wouldn't be root-suffocation or overwatering, though, it could be that the rain leached away enough nutrients to leave the plant in a malnourished state, weak enough to succumb to a fungal infection. The more I contend with these sickly tomato plants, the more I think the cause is nutritional. 1) Why doesn't it affect the upper limbs until the plant has been severely weakened by the loss of lower limbs? 2) Why doesn't it affect fruiting limbs? 3) Why do symptoms only show after fruit-set? 4) Why does a fungus, which is naturally present in the air all the time, only attack sometimes and only some plants? Can a fungus be specific to only the tomato plant? 5) Septoria strikes after a wet season, which is conducive to fungal growth, but leached soil is also associated with increased rainfall. Heavy rains leach soil of calcium, sulfur, magnesium, and potassium (in that order - per The Nature and Properties of Soils – Harry Oliver Buckman, Nyle C. Brady). The leached soil leaves the plant vulnerable to disease while, at the same time, the increased humidity favors fungal infestation. This explains why lower limbs, the limbs less defended by the plant, are attacked first. It also explains why limbs not containing fruit are attacked first, the plant defends the fruit, not the leaves. And it also explains why the disease strikes most often after fruit-set, since the plant is having to divide its nutrition with the fruit. Therefore the cause would be nutritional. The mechanism (fungus or bacteria) for decay isn't important. I applied lime everywhere. I dusted the plants as well as covered the ground in liberal amounts. I want to accomplish 2 things with this. 1) To add calcium to the soil and plant (if possible). 2) Rain can have quite a low ph, therefore I want to neutralize that acid before it hits the soil. The acid rain will also break the calcium loose in the lime. A possible third effect may be to raise the ph on the leaves, making it uncomfortable for the fungus (if so, I would consider this more of a side-effect than the main idea). I started fertilizing with calcium nitrate, potassium sulfate, and magnesium sulfate (epsom salts). I will update this answer as I discover more. My goodness...based on the two pictures, pruning would definitely help the air-flow. Make sure you clean your pruners with alcohol between each plant pruned. FYI, it takes ONE fungal spore to infect a plant. The spores are in the soil and watering will splash the spore onto leaves. Once the plant has been infected there is not much one can do to stop the infection. Fungicides are predominately a protective measure to prevent that one spore infecting the plant. Sort of a raincoat. Since this question/answer is a year old, what DID happen? Did you ever do a pH test of your soil? What got planted where these tomatoes were? Have you tried Bacillus subtillis as a fungicide? I think that is in 'Serenade'...and would like to hear that it does more than the traditional 'raincoat' fungicides. This doesn't look like nutrient deficiency. That comes on much more slowly. Not the answer you're looking for? Browse other questions tagged vegetables tomatoes diseases leaves rain or ask your own question. What's affecting this tomato plant? Why have my tomato leaves started yellowing at the base? Is it safe to eat tomatoes affected by early blight? Are yellow ladybugs a threat to tomato plants? Why are my tomato leaves turning yellow, with brown spots?